"In the Quad, a galaxy on the brink of a bloody interplanetary class war, a fun loving trio of bounty hunters attempt to remain impartial as they chase deadly warrants." It is executive produced by David Fortier and Ivan Scheenberg, both who produced the very popular series, Orphan Black. John-Kamen, Ashmore and Macfarlane are our bounty hunters and Stewart is the mysterious guy who seems to know all about Dutch (John-Kamen). The series premiere opens to us seeing professional bounty hunters John (Ashmore) getting tortured and Dutch getting captured "trying" to rescue him. But it was all part of the plan because they weren't there for the merchandise, but rather, the man with the merchandise. The hunters work as what is called Reclamation Agents for The RAC or the Company. As Dutch and John get their next assignment, John slips off to tackle this one himself, without explaining to Dutch what he's up to. Turns out the next assignment is a kill warrant for D'Avin (Macfarlane), who just happens to be John's brother. The rest of the episode is dealing with the fallout of John headed off to save his brother from the kill warrant and what the team has to do to fix the myriad of wrongs they committed. In the end... well, you'll see if you watch it. 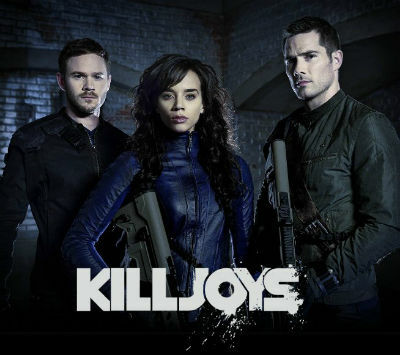 My first impression of Killjoys came from the ads and my first thought was this is trying to be another Firefly. While watching the show, it continued to drive the "feel" home, where our team of agents end up being outsiders working within an intergalactic system that is in the middle of a feud or civil war. The characters have traits we can all get behind. Dutch is mesmerizing to watch on screen, from her special weaponry, how she can handle an adversary to how she can slink down a hallway and catch every man's attention, both on and off-screen! There's also something about her that was hinted at, but not fully explained. Something that could be a sweet little secret for a slow reveal throughout the upcoming season. If they play this right. John is the man who has a job he likes and his brother, D'avin, is a slightly fractured ex-soldier with a wee bit of PTSD. Regardless of who is watching, the eye-candy factor of our team is unmistakable, the action is promising, and the team, having an entire galaxy to explore while they carry out warrants. All with the team dynamic evolving for viewers to follow. Not to mention Dutch's mystery benefactor (Stewart) and possible trainer, who would seem to have always been following her throughout the universe. Killjoys had a slow build in the first half of the premiere but the story started to get my attention and became an enjoyable ride in the latter half. The characters do need to spend a bit more time with creating the relationships between everyone, but the basics of the team are out there. It's not a spit-shiny new world, but has a potential for a nice, dark gritty adventure. The effects are decent, and I can't wait until we explore their ship more. I can't wait to see what comes of the story and the vibe, and if this could very well be a decent stand-in for my Firefly memories. It started with a slow burn, igniting hope for a good new sci-fi series. If you look around the web, opinions range from great to horrible, depending on the source. Fab boys like it while the professionals are ripping it. If you haven't already, check it out if you have a chance. You just might like it. But you do have to give it a chance to grow on you, considering how we come into the story cold.